Title: 'Angliae, Scotiae et Hiberniae, sive Brittanicar: Insularum descriptio'. 1584 Latin edition. A famous map of the British Isles. 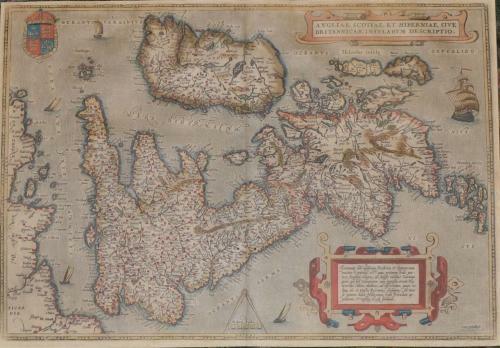 Probably the earliest map of the British Isles still readily available.., and the collector will at once see that the proportions of Ireland and Scotland compared with England and Wales are not correct; but, nevertheless, it was an influential map with a very wide circulation. Many of the names betray its ecclesiastical sources; it was issued only about thirty years after the Dissolution of the Monasteries and quite a number of the religious institutions shown on it no longer existed when it was published. No roads, rivers or bridges are shown, although towns where fords would have been are indicated, but it would have been practically useless as a route map. (Moreland & Bannister). In very good condition. There are two small holes near the center fold about 4 inches above the bottom edge. They appear to be the work of an enterprising bookworm.